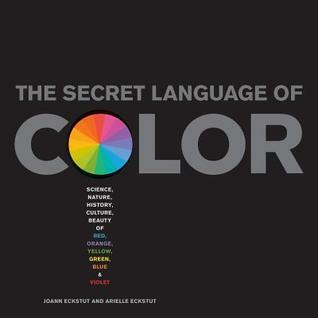 This is, without question, one of the best books I have ever read on the subject of color. Arielle Eckstut has created a content-rich book written in a friendly and conversational manner that makes so many of the very nebulous color concepts and theories readily understandable – even fascinating. The book is divided as follows: a first chapter that explains some of the misconceptions of color (e.g., Yellow/Blue/Red are not primary colors), explains the additive and subtractive colors, color wave lengths, and our history of understanding color. After, that, the main colors from Red to Violet are discussed. But not in a ponderous educational text sort of way; rather, the ways that colors have shaped our human history. From the Dukes of Orange to the royal purple, blue bloods, and Absinthe poisoning. The author has found some great anecdotes that explain so many color phrases that we use today (e.g., green eyed monster). In additional to the cultural history, there are whole sections devoted to nature: animals, plants, sky/celestial colors, etc. Every chapter is wonderfully illustrated – with photos, images, graphs – and beautifully laid out as wll. My hat is off to the graphic designer of this book: there are so many sound principles in the design that make it such a pleasure and ease to read. Indeed, the book is graphic heavy, not text heavy, as befitting a book on color. There are many standouts to separate and cleanly explain certain concepts. This book is perfectly suited for the layman – no art or chemist background needed. For painters, graphic designers, photographers, etc….there is just so much information and yet it is easy to read and follow. I read the entire book cover to cover in under 3 hours and never once felt like I was reading a dry textbook. Yet it doesn’t gloss over the important concepts in favor of pretty pictures, either. You do learn (and quite a bit) not only the technical side of color theory but also wonderful factoids of history as well. I can easily say this is one of the best books I’ve read this year. Informative, fun, interesting, conversational, fascinating, useful, and, yes, eye candy of color. Obtained as an ARC from the publisher. This entry was posted in Book Reviews, home schooling, Photography. Bookmark the permalink. Thx so much for the wonderful and thoughtful review! It’s the first I’ve found, so it’s especially sweet. Where are you a librarian?